World’s Largest Lobster is in South Australia! 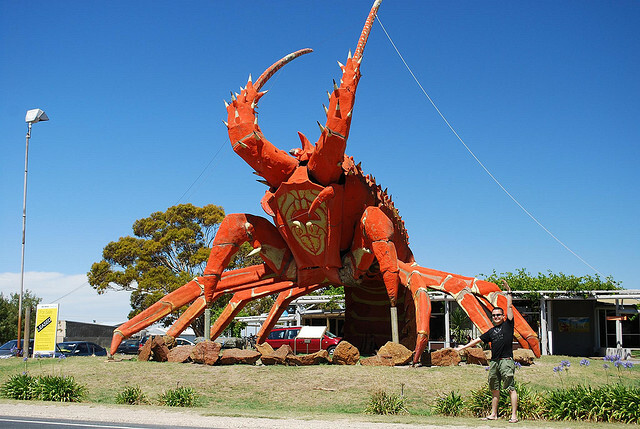 The World’s Largest Lobster resides in Kingston SE, South Australia. Affectionately called “Larry the Lobster”, this Big Thing To See in Australia is a 17 metre tall spiny lobster! In 1979, Larry was built from steel and fibreglass for Ian Backler and Rob Moyse by artist Paul Kelly, who also built the North Adelaide Big Scotsman! Mr. Kelly actually built Larry in Edwardstown, and then transported him over the area roads. 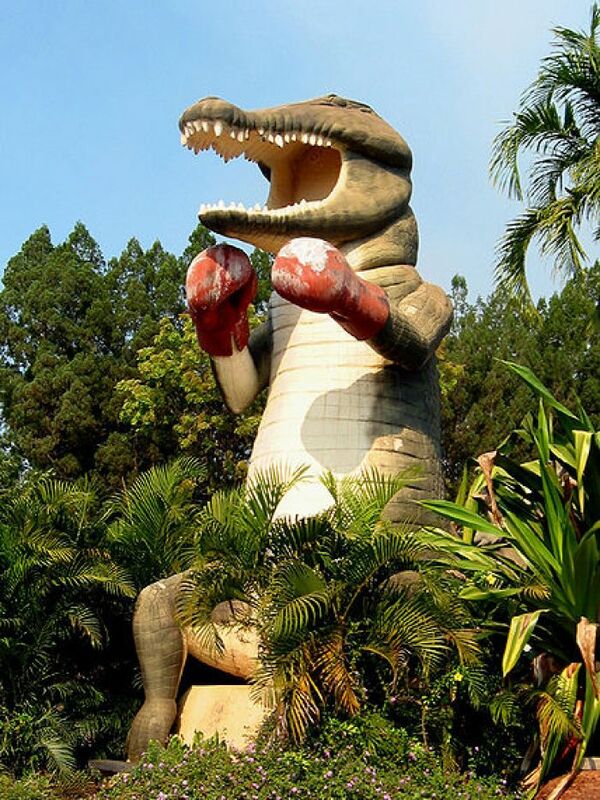 The World’s Largest Boxing Crocodile! 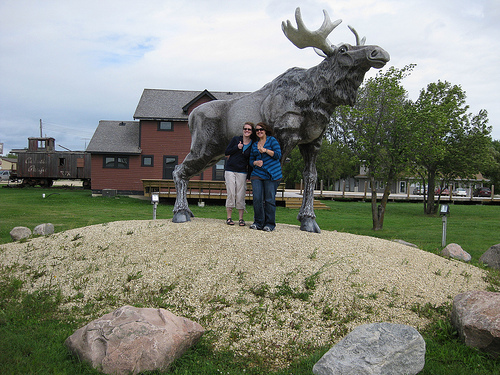 Children’s cartoon hero Bullwinkle is perhaps the most famous moose ever, but Riverton, Manitoba, is home to this Big Thing To See in Canada — the amazing World’s Largest Moose statue! Officially named “Lundi Moose”, the statue is located at a park on Olaf Street Southwest in downtown Riverton (population: 600), this Magnificent Moose was created by artist Grant McLaughlin. The Big Moose is 14 feet long! Some of our Big Things To See in Canada are simply too Big to imagine how they were built! The World’s Tallest Totem Pole is one of them — 52.7 metres (173 feet) tall, and it’s located in Alert Bay, British Columbia, Canada. It’s just amazing! Totem poles are aboriginal art, an ancient practice of carving that is handed down through the generations of the First Nations. 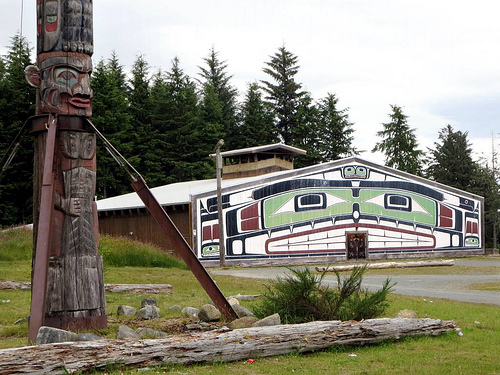 A totem pole preserves history, heritage, and also honors local native tribal rituals and spirits. 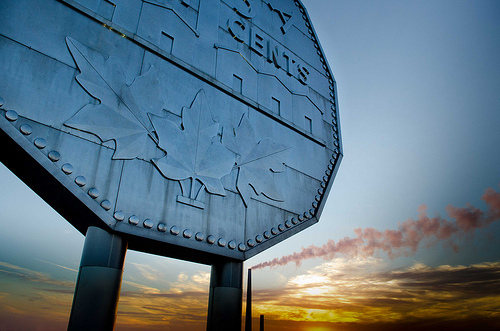 The World’s Largest Nickel is worth a lot more than 5 Canadian cents! 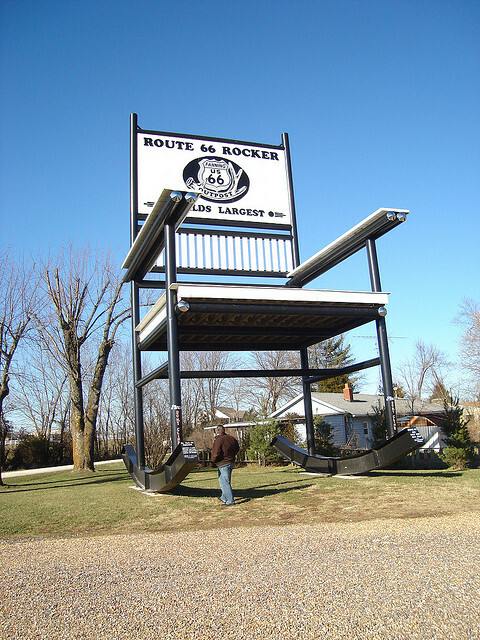 This 9 meter (30 feet) tall monumental sculpture near Sudbury, Ontario, is one of the Biggest Examples of Pocket Money anywhere in the world! Located on the grounds of Dynamic Earth, the 12-sided Big Nickel is atop a hill near the intersection of Big Nickel Drive and Municipal Road 55 in Greater Sudbury. The World’s Largest Guitar isn’t going to be played any time soon, but it’s definitely one of the Big Things To See in New South Wales! 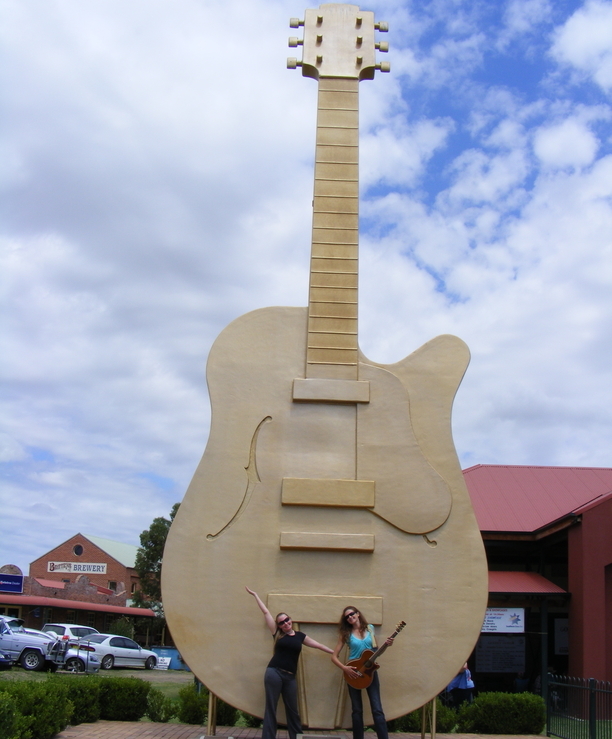 Australian music lovers and tourists alike have been amazed by this 12 meter (40 feet) tall Big Guitar since 1988 when the famous Slim Dusty unveiled The Golden Guitar in front of the wonderful Longyard Hotel in Tamworth. It weights over 500 kilograms (1000 pounds) and is made of wood and fiberglass, and reinforced with steel! 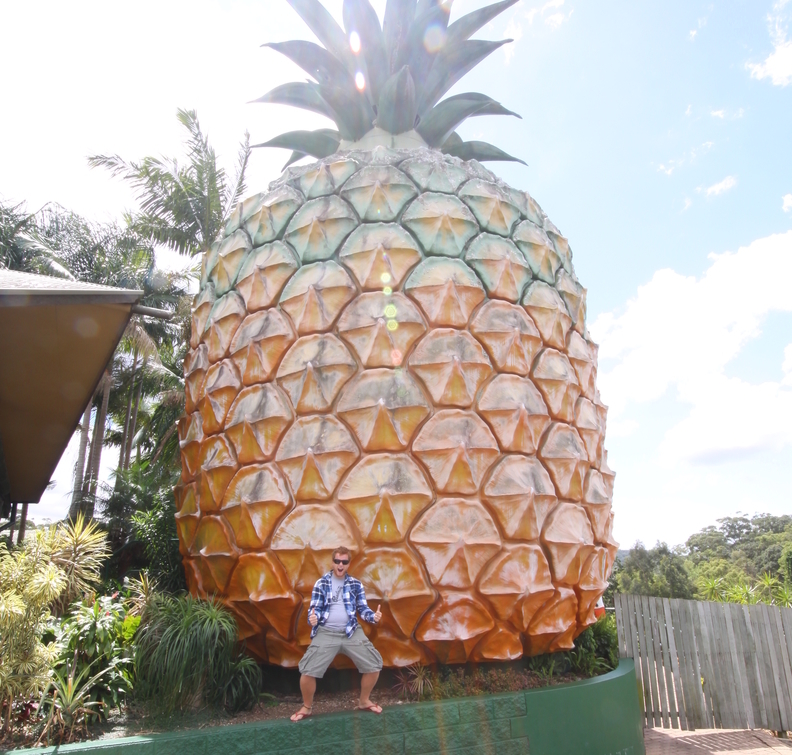 This World’s Largest Pineapple is one of Australia’s most amazing Big Things To See! Located in Woombye, Queensland, this tourist attraction is a favorite of visitors to the Sunshine Coast. 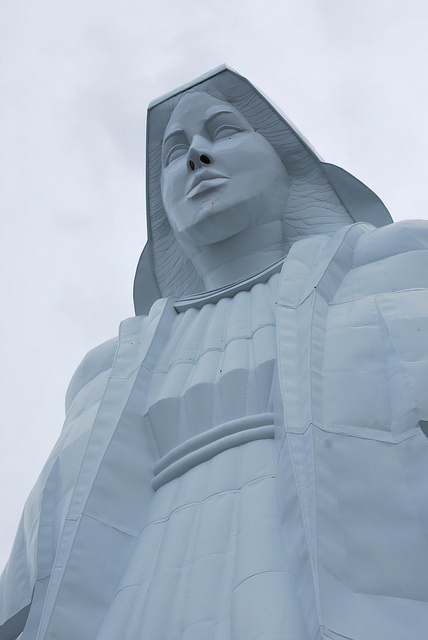 Made from fibreglass and standing 16 metres tall, it was originally built in 1971. Anyone Can Actually Add on to this Big Thing To See! -- Why Not You? What's Big and Orange and the Pride of Ohakune? 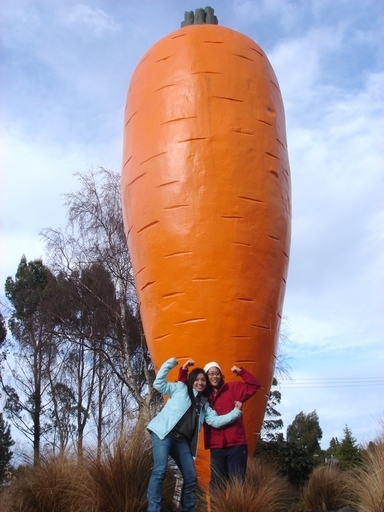 The World’s Largest Carrot rests in the town of Ohakune, Manawatu-Wanganui Region, New Zealand. At 7.5 metres tall, this Big Thing To See in the World is a very large model of the tasty orange vegetable, and has been installed in the same spot since 1984 – it will celebrate its 30th anniversary this year – and amazingly, no Big Rampaging Bugs Bunny Statue has tried to chow down on this Big Carrot!! How famous is the Biggest Soda in New Zealand? 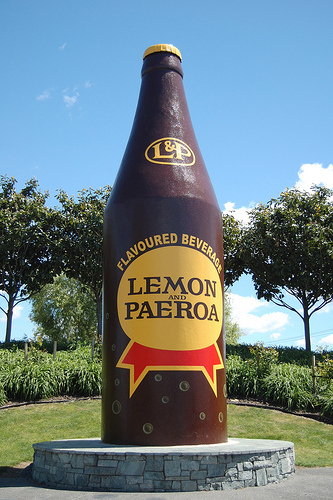 Paeroa, Waikato is the hometown of a wonderful WORLD FAMOUS soda, and has this Big Thing To See in the World as its famous symbol! Have you heard about Woinic? Woinic is simply the coolest Big Thing To See in Northern France! 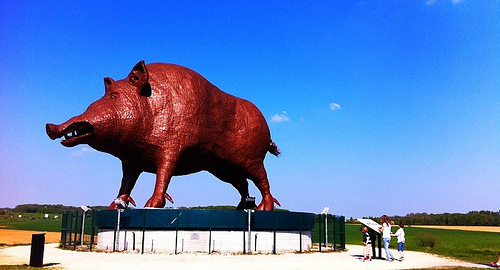 He is the World’s Largest Boar, and is located just off Autoroute A 34. This Big Boar is a staggering 8.5 meters (28 feet) tall, 14 meters (46 feet) long and 5 meters (16.5 feet) wide! This work of metal sculptor Eric Sléziak took an amazing 12 thousand hours to complete! The artist used 50 metric tonnes (over 55 tons) of material, and sculpted Woinic from 1983 to 1993! Do you take cream and sugar in your coffee? You'll need a lot of it! The World’s Largest Coffee Potsits at the entrance to the town of Selb in Bavaria. 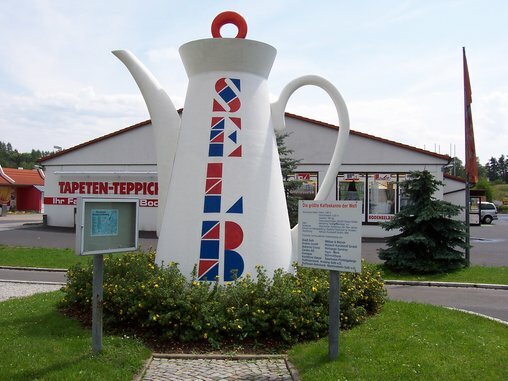 As Germany’s most impressive Big Thing To See, thisBig Coffee Container is right at home in Selb, a town famed for its well-known porcelain! The World's Largest Sundial in Jaipur has been telling time for almost 300 years! 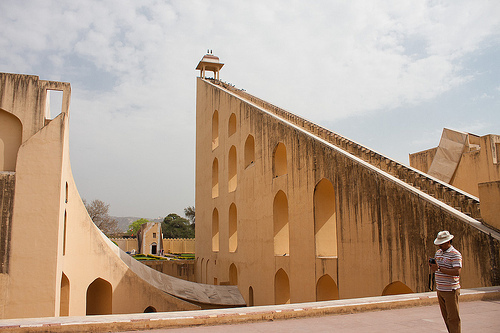 The Samrat Yantra in Jaipur is part of the Jantar Mantar (translation: instruments for calculation), a Big Collection of 14 devices built for measuring time, for astronomy, and for astrology, in the 18th century. You won't want to "Temple Run"! One of India's most breathtaking temples is in Bangalore. The Big Thing To See in Bangalore has to be the Bull Temple! 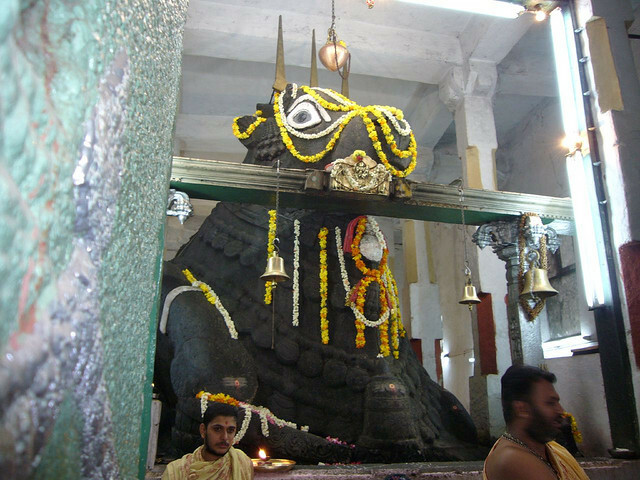 Known locally as Dodda Ganeshana Gudi, this temple is located at the Basavanagudi area of the city. Have you made it to "The Big Time" in Carefree, Arizona? Some of today’s young people may not be familiar with analog clocks — you know, the ones with hands that move in a circle from 12 to 1, and so on. But those of you old enough to legally book a car rental will remember — in fact, you may prefer them! Today, most people tell you what time it is by looking at a cell phone, or maybe a digital clock in a car or on a wall. But what came before all of these technologies? That’s right — the sundial! Our Lady of the Rockies is one of the most beautiful landmarks inMontana, and this Big Thing To See has a beautiful story behind its creation! 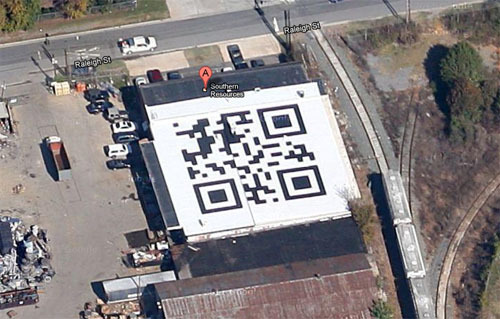 How Quick will your Response be -- to this cool rooftop building art in Charlotte? This Big Thing To See in the USA is best viewed from the air, so unless you’re Iron Man or flying in a low-flying plane, you may need to use Google Maps to enjoy it properly! It would take a long time to finish off this impressive Pringle near Pocatello! 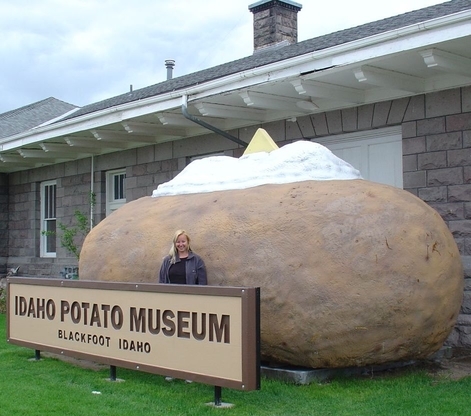 The Idaho Potato Museum is the home of this Big Thing To See in the USA, one of the Procter & Gamble company’s greatest (and strangest) achievements in the area of snack foods. The World’s Largest Potato Crisp is a Pringles brand crisp that was engineered in Jackson, Tennessee, way back in June 1991. 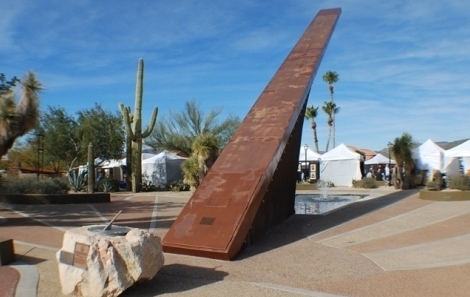 This amazing monument to America’s love of the greasy, artificially-manufactured snacks — they used to contain more ACTUAL POTATOES than salt & preservatives — is 25 inches long and over 14 inches wide, weighs 5.4 ounces (1/3 pound), and has more surface area than the usual family-size pizza! 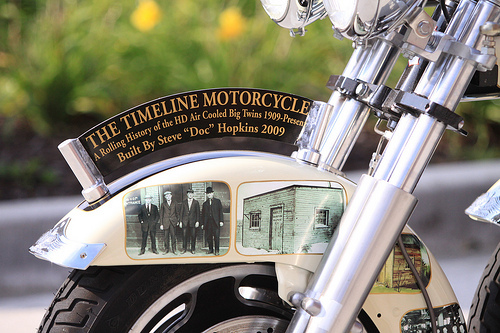 This Big Motorcycle near Green Bay is a Rolling History of Harley-Davidson! On Wisconsin State Highway 29, about 25 miles northwest of Green Bay and just east of the village of Bonduel, Doc’s Harley-Davidson of Shawano County is the area’s premier dealership and destination for motorcycle enthusiasts. And nothing is cooler at Doc’s than The Timeline! Some giant objects are built just to impress people. Some are built to honor the dead, the heroic, or both. Some are just built because we Americans love to break records! 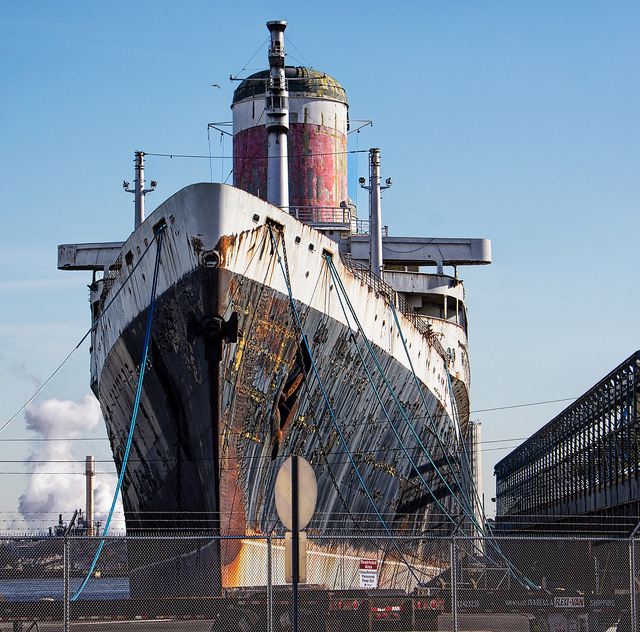 This Big Thing To See in North Carolina had an important purpose – to prevent ships in the Atlantic Ocean from running aground in the Diamond Shoals area, which is just offshore at Cape Hatteras! We've never Seen anything like them in Venice, California! 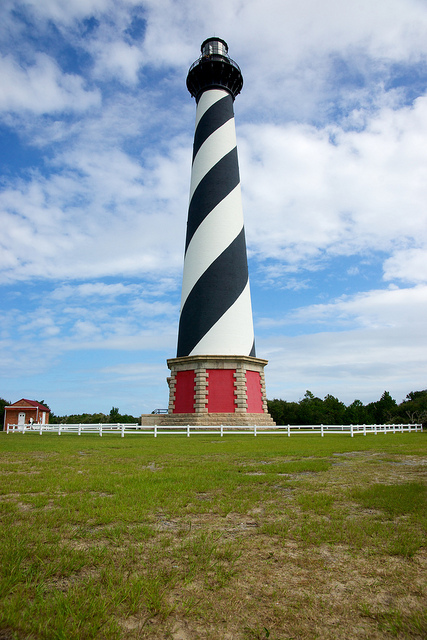 Binoculars help you to see far-away things, and this Big Thing in the USA is certainly a sight you’ll want to see! 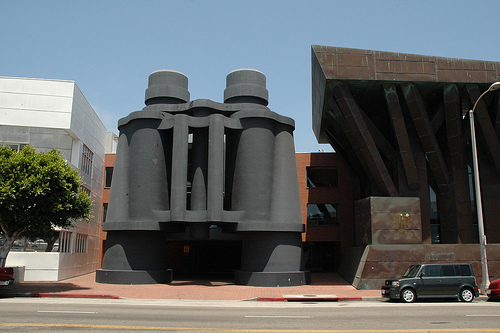 Located in Los Angeles County in California, specifically on Main Street in Venice, are the World’s Largest Binoculars! Unfortunately no jolly green giant or Godzilla movie monster is going to come along and pick these up and use them — these Big Binoculars were built right into the side of Venice’s Chiat-Day Building. Unless you have the muscles of the Incredible Hulk, you won’t be able to use this Big Horseshoe to play a game! 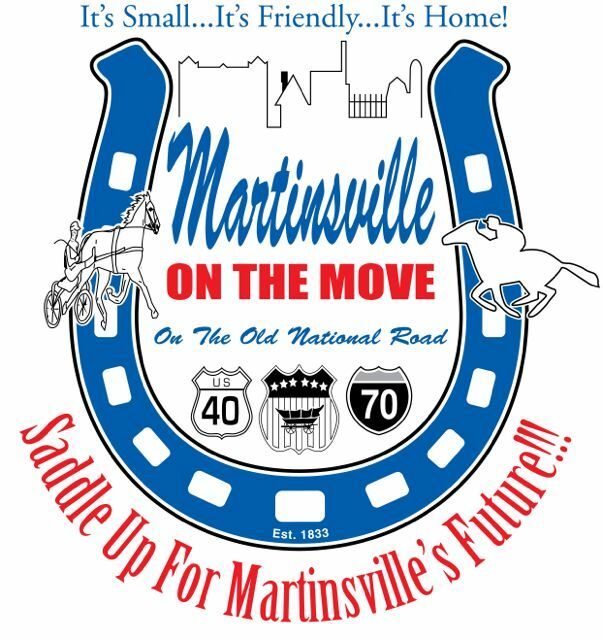 Located at the Martinsville Fairgrounds, 620 South York Street in Martinsville, Illinois, this Big Thing To See in the USA was recognized in 2013 as the current World’s Largest Horseshoe by Guinness World Record officials. It’s one of the most amazing pieces of iron ever poured at the Rowe Foundry, also located in Martinsville. 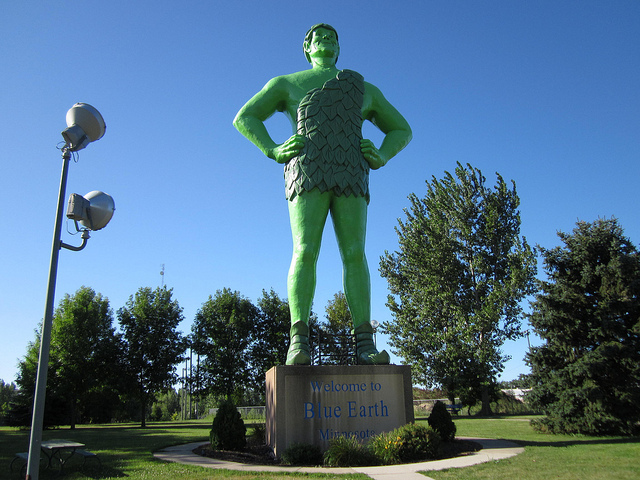 The Jolly Green Giant welcomes visitors in Blue Earth, Minnesota. For 85 years, this American mascot has been a Big Thing To See in the USA… on TV commercials, in print advertising, and on the packaging of some of your favorite tasty vegetables! In fact, if you watched television at all in the 20th century, you probably read the first sentence of this story in the sing-song voice of the Jolly Green Giant! 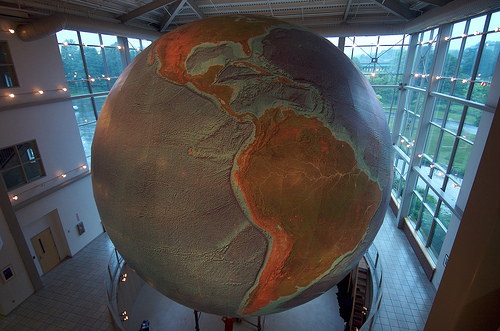 The World’s Largest Rotating and Revolving Globe is nicknamed “Eartha”, and it can be found at DeLorme’s headquarters in Yarmouth, Maine, a 15-minute drive north of Portland. Wall Drug Store is one of America’s Biggest Retail Shops and, located 50 miles east of Rapid City, it’s also a popular destination for Interstate 90 travelers passing through South Dakota. Wall Drug is the World’s Largest Drug Store and this Big Thing To See in the USA is one of the coolest places to check out whenever you’re in the Pacific Northwest. 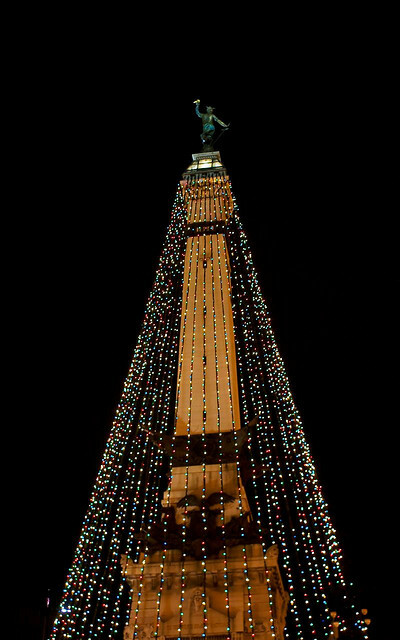 These Big Things To See in San Antonio, Texas can really kick all the others' butts! 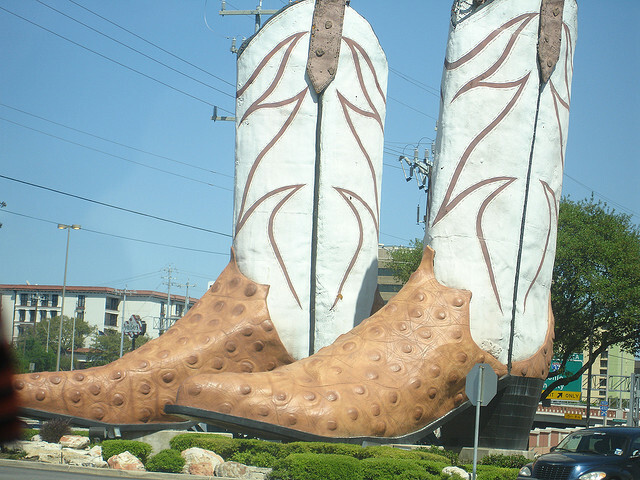 The World’s Largest Cowboy Boots are a 40 foot tall pair of boots that represent the worldwide cowboy phenomenon. If you know any 150 foot tall cowboys — well, we don’t even mess around with regular size cowboys! They love their boots, and it’s a big deal when a man (or woman) gets a new pair of them! Who doesn't love some M&Ms and a Coke? On the world-famous Las Vegas Strip, you can find this Big Thing To See in the USA. 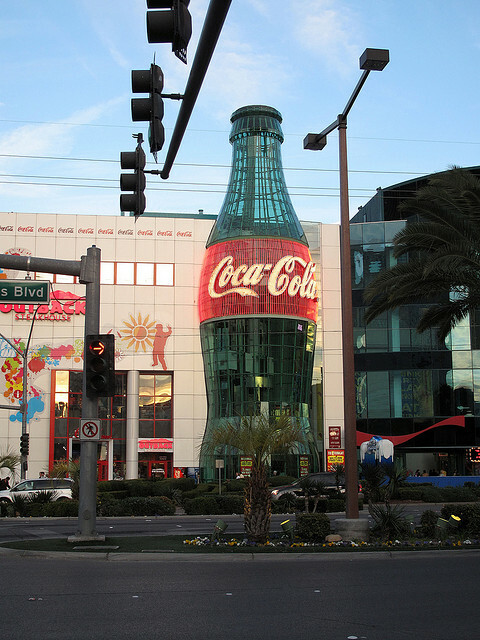 Built in the 1990s, this 100-foot Giant Soda Pop is in front of Everything Coca-Cola, the awesome Vegas Coke store. It’s located at the Showcase Mall in front of the MGM Grand. Please pass the catsup... what? "It's too heavy"? 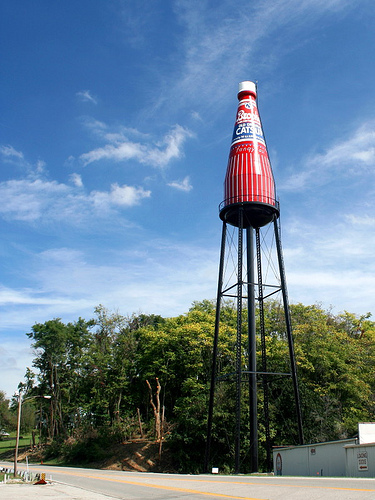 The subject of this Big Thing To See in the USA could have come straight from the kitchen table of Paul Bunyan — it’s the World’s Largest Catsup Bottle, and it’s perched atop a tower near St. Louis, Missouri. 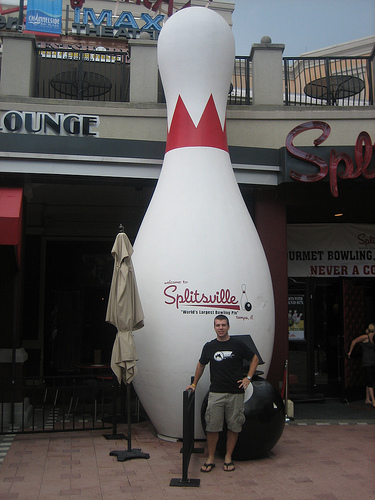 Tampa locals and tourists are Bowled Over by this Big Thing To See! Channelside Bay Plaza is the home of this Big Thing To See in the USA. The upscale entertainment destination is one of Tampa’s best places to find nightlife, good restaurants, bars and shopping. Folks around the Beckley area of West Virginia must think Big about bird watching! 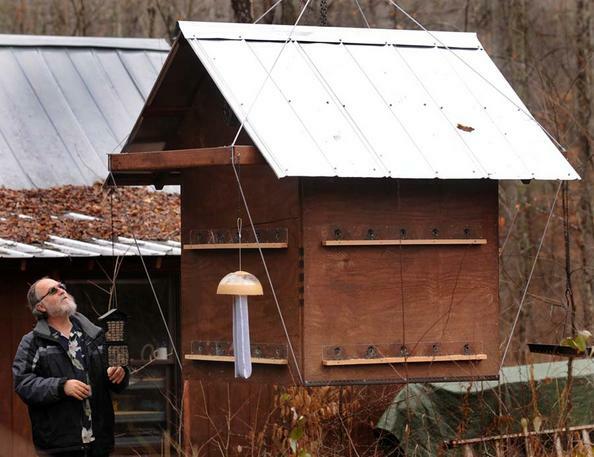 In Greenbrier County, West Virginia, the largest bird feeder in the world today hangs near the Greenbrier River Trail. 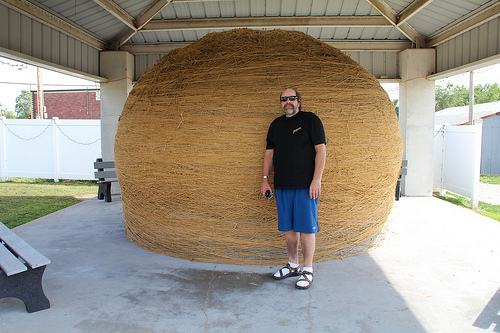 Built by William “Dan” Greene, a retired school teacher, and Christopher Ide, this Big Thing To See in the USAwas designed to hold 760 pounds of bird seed! 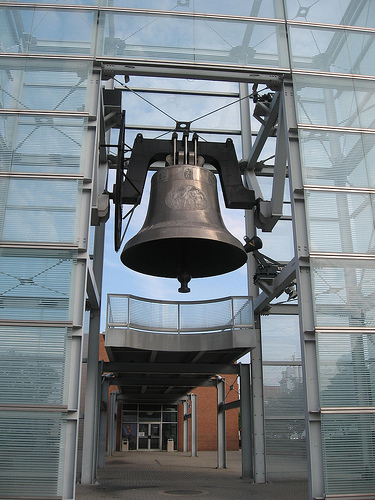 The World Peace Bell is found in Newport, a small Kentucky city just outside of Cincinnati, Ohio. 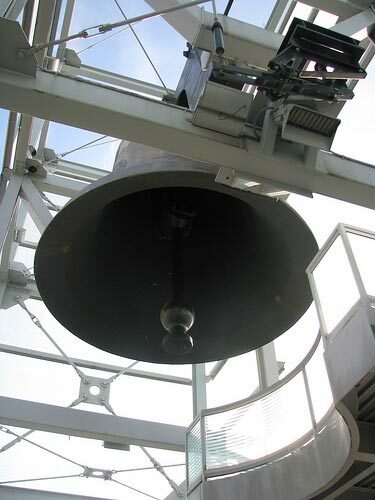 This amazing Big Thing To See in the USA is a former World Record holder that was, until a few years ago, the Biggest Bell in the World! When you’re traveling around our Great Big Country, or just around the Northeast, you’re bound to see some Big Things in the USA. New York, Washington, Boston — they all have their own natural beauty, special landmarks, tourist attractions, and the occasional weird object or item that’s worth a road trip in your cheap rental car. But the Big Thing To See we’re going to talk about now isn’t exactly a typical, beautiful sight that everyone wants to stop and look at. In fact, it’s a bit of an eyesore for the City of Brotherly Love, Philadelphia! 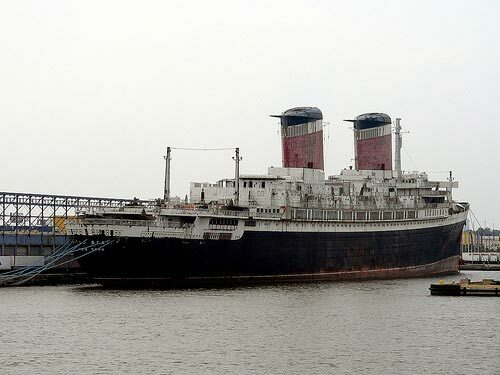 The SS United States is a Giant Ocean Liner, now docked at a pier on the Delaware River, where she has decayed for over 17 years. 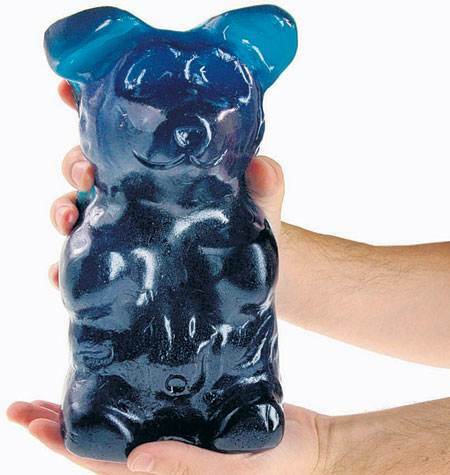 But today, let’s take a road trip to find a totally different example of one of our Big Things To See in the USA… now first off, let’s establish something: do you like candy? Do you REALLY like candy? 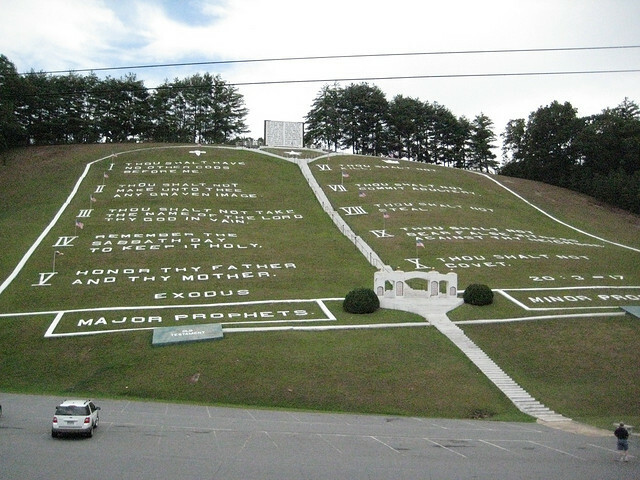 Near the western boundary of North Carolina sits Fields of the Wood Bible Park, a park built by the Church of God of Prophecy, open to the public, and free to visitors. Minnesota may be nicknamed the “Land of 10,000 Lakes”, but this Big Thing To See is about as far away as you might get from spending time in this state’s famous Big Outdoors. In fact, what has been called “the Sprawl of America” disparagingly by some folks could easily be called the BIG INDOORS! 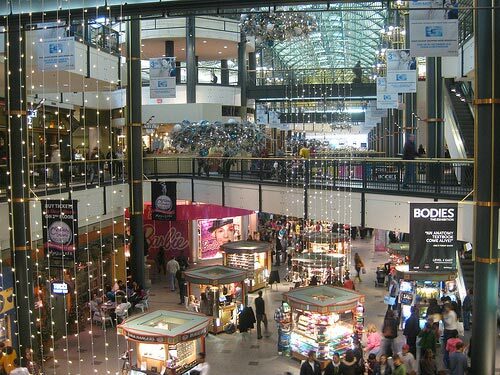 The Mall of America in the Minneapolis suburb of Bloomington, Minnesota, is the Largest Shopping Mall in the USA. 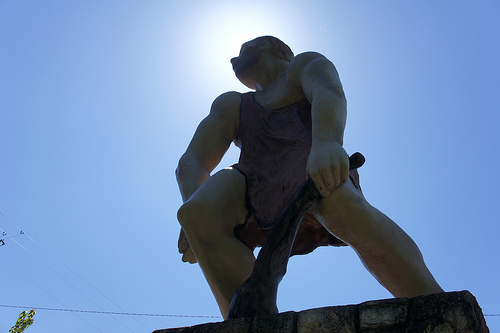 This Big Thing To See in the USA is an amazing 18 foot statue of a prehistoric man, complete with animal skin shirt and wooden club. The fun thing about driving around America in a cool rental car, looking for Big Things To See in the USA, is that you never know when & where you’ll find a great one. But to find 2 awesome Big Things at the same place? Well, that’s almost unheard of! 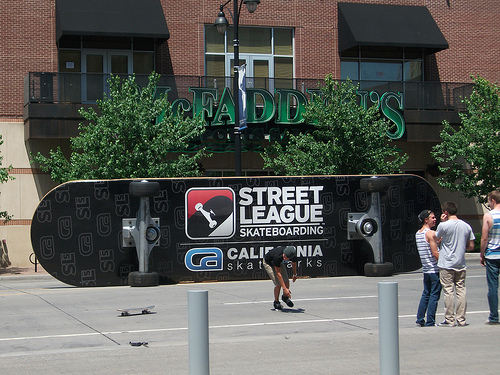 If you like to skateboard, one Big Thing To Ride is truly amazing! This Big Thing To See in the USA was built to break a Guinness World Record, and that idea came from professional skateboarder Rob Dyrdek. If You Have a Really Tall Ladder, You Can Have a Seat Right Here! Big Things To See in the USA enjoys telling our VroomVroomVroom car rental customers about Awesome Attractions and Massive Merchandise all across this great nation! And we know that a lot of our readers may be a little too young to enjoy sitting on a quiet front porch after a long day’s work. In Houston, Texas, discover proof that one of our leaders had a head full of rocks! Texas is the largest state in the continental USA, and Houston is its biggest city. So, of course you can find several examples of Big Things To See in Houston, such as the world’s largest livestock show, the Houston Livestock Show and Rodeo. The city is also home to Spec’s, an 80-thousand square foot warehouse that’s one of the world’s largest liquor stores. 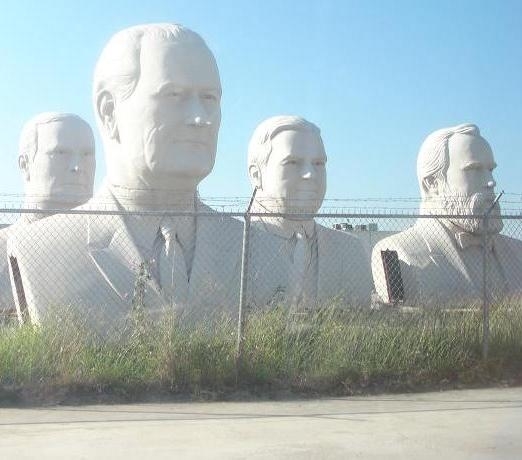 But let’s stay sober (for now) and drive our rental car to find some of the most unusual Big Things in the Huge State of Texas… the Big President Heads at David Adickes’ studio! We’re wondering if they have a choice of different colors for giant seat cushions? It can be pretty tiring, driving around the USA in that rental car that you got such a cheap rate on, visiting all of the Big Things To See in this great country. 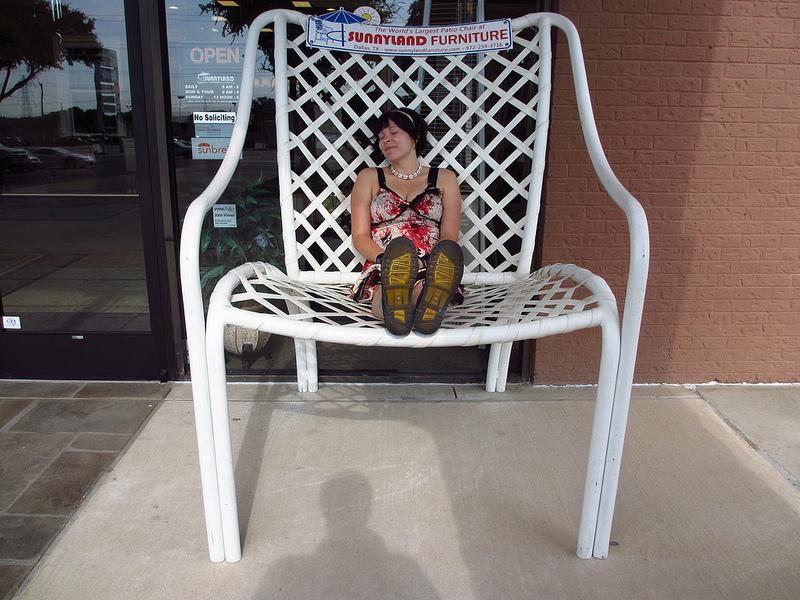 So when you’re in the Dallas, Texas area, stop and see the World’s Largest Patio Chair — and then just have a seat and relax for awhile! We’re sad to say that one of our Big Things To See in the USA has been shut down by the government! 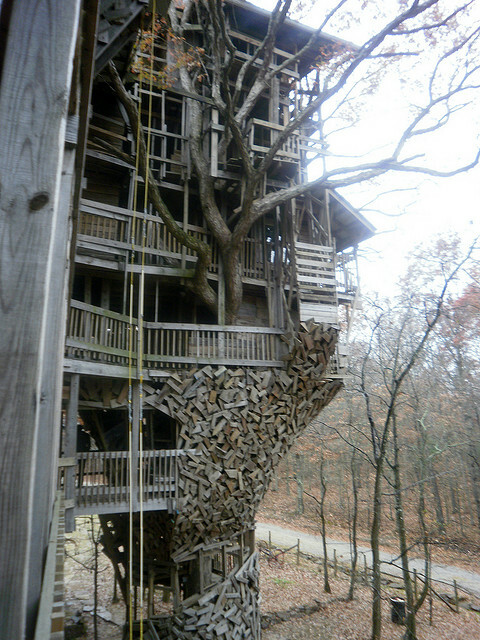 In Crossville, Tennessee — about an hour’s drive west in a rental car from Knoxville — you could find the World’s Largest Treehouse at 364 Beehive Lane! 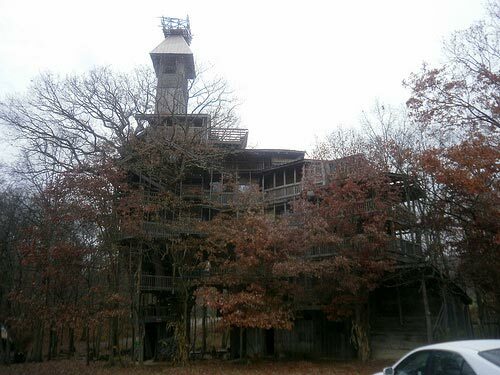 Unfortunately, due to an August 2012 decision of Mr. Christopher Bainbridge, director of codes enforcement for the Tennessee State Fire Marshal’s office, this Big Treehouse that was once free and open to the public now has a locked gate and a sign telling visitors that they have to turn back. But we still want to tell you about this remarkable building and show you some cool photographs, even though it is currently closed to the public! 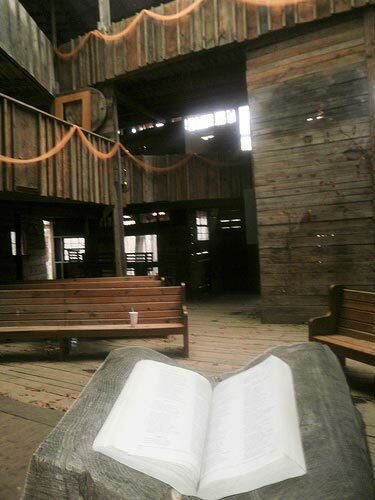 The treehouse is God’s house, according to Minister Burgess, and everyone was welcome. Across from it, the grass in a large field is cut in a pattern to spell out the name “Jesus”. Before its closure in 2012, it attracted almost 100 visitors per day. 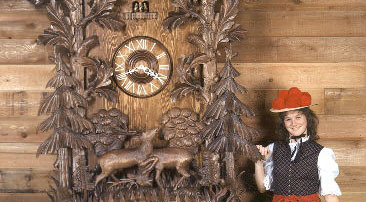 The gates to the Big Treehouse have been locked since a letter was sent to Burgess, ordering the building to be closed to the public immediately “due to safety concerns”. An online petition started by Crossville resident Natosha Carson asking Cumberland County and the Tennessee Fire Marshal’s Office to reopen the building to the public gathered over 2,500 signatures in just a few weeks — but so far, it remains closed. If and when it reopens, here’s how you get to the World’s Largest Treehouse! Drive your rental car down Interstate 40 west from Knoxville (or east from Nashville) and take exit 320. Then, drive north on Highway 298 and turn right on Cook Road. After a mile, the road takes a sharp right, but you need to turn left onto Beehive Lane. You’re way out in the gorgeous Tennessee countryside, and the pavement ends, but keep driving your trusty car rental onto the dirt and gravel. You’ll find the Big Treehouse on the right. Have you ever felt like you’ll never get done with all your laundry? We’ve all walked into our home or apartment one evening, only to discover that an invasion has taken place… and the army of dirty clothes will not easily be turned back! 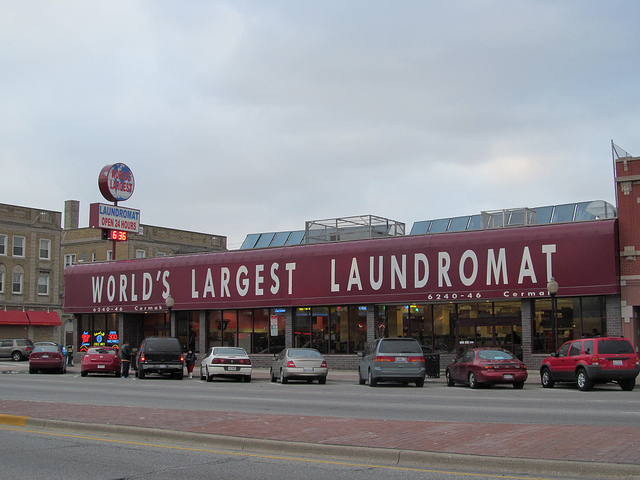 But no matter how tall the piles of dirty socks are, no matter how stinky the laundry basket is, VroomVroomVroom’s friends in the Chicagoland area know they’ve got a secret weapon in nearby Berwyn, Illinois: Tom Benson’s World’s Largest Laundromat! 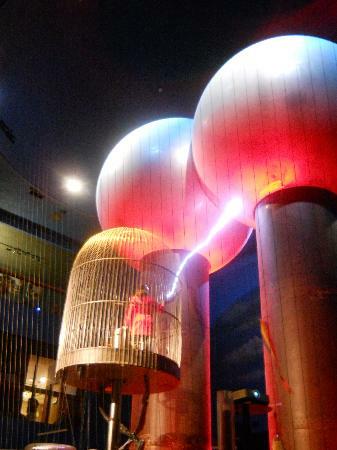 Dr. Van de Graaff never imagined his generator would electrify so many Boston school children. 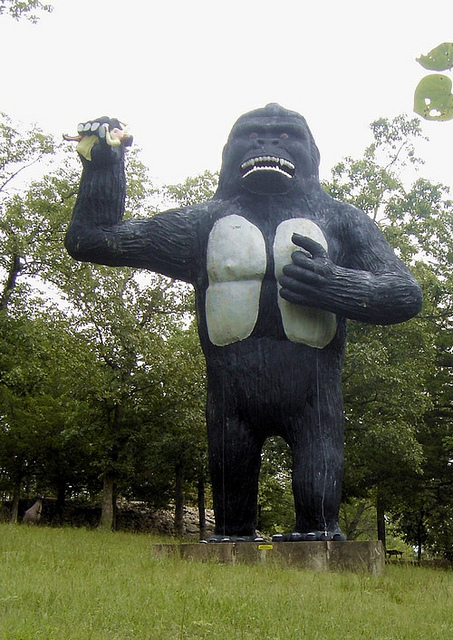 80 Years Young, King Kong is Still a Big Gorilla To See in the USA! King Kong is the Big Movie Gorilla who climbed New York City’s Empire State Building way back in his first film, which came out in 1933. Six more movies have featured this member of the World’s Biggest Movie Monsters, but is he really a monster? 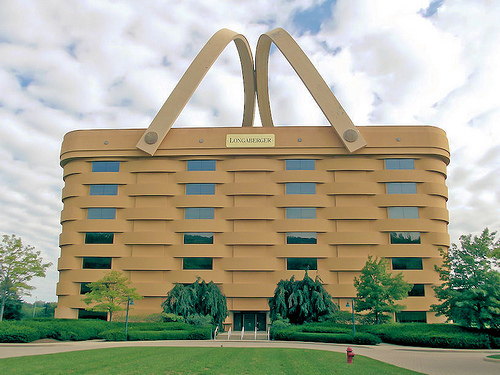 Located about 34 miles east of Columbus, the Biggest Basket in the USA is also the state of Ohio’s Coolest Corporate Office Building! The Longaberger company is famed worldwide for its high-quality, handmade maple wood baskets. So if you find yourself in the Columbus area, point your rental car in the direction of Newark, Ohio, where you can see the World’s Largest Basket! What time is it? Time for a road trip! What time is it? It’s time for a road trip! 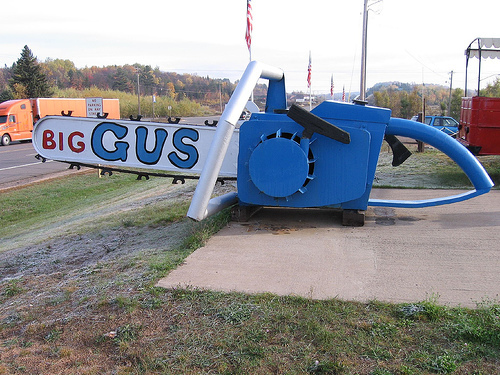 From deep in the heart of Dixie comes our next Big Thing To See in the USA… the World’s Largest Cuckoo Clock!